So, here’s my annual round-up of what I knit during the previous year. I didn’t knit Adam anything in 2010 (insert sad face), but I did get married to him, so he has many more years of suffering through knitted projects. HAHAHA. I didn’t knit as much as I would like, probably because I became totally sucked into wedding planning and now am having wedding withdrawal. 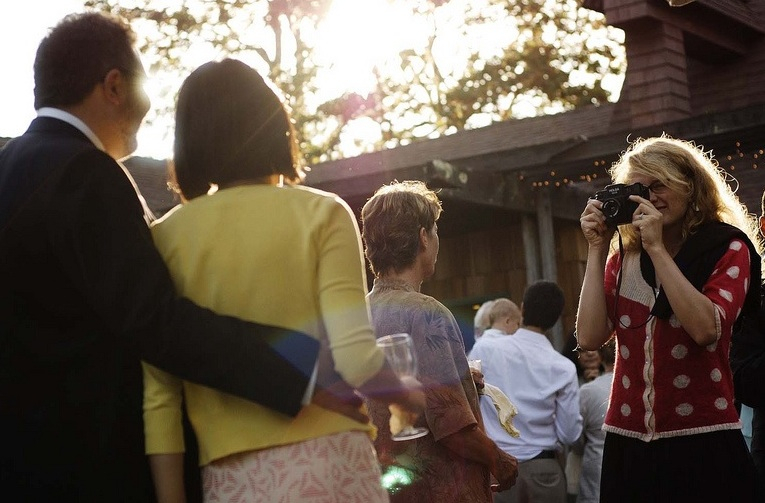 I am dealing with my wedding withdrawal by (a) offering to plan the weddings of strangers, with, as one stranger said, “the look of crazy in my eye” and (b) making the most comprehensive photobook of all time. I may write a post about photobook services later this month, which I hope will be helpful to other people trying to figure out which service to use. Anyway, I loved our wedding and our honeymoon, but now I am moving back into regular life, including lots of knitting. I also started a new job at the end of last year, which means that I commute regularly again, which means more knitting and reading time. When I am at home, I always feel I should be doing something else. I don’t have any real specific goals for 2011, except knitting more, which shouldn’t be too hard, since I only knit six things this year. Posted in Finished Objects 2010, Uncategorized at January 8th, 2011. Pattern: My own. I cast on 108 stitches with a provisional cast-on with the smaller needle, knit 12 rounds, knit a purl round, switched to larger needles, knit another 12 rounds, undid the provisional cast-on so the stitches were live, knit the two rounds together with the second color and then knit 10 rounds of the second color (yellow), then 12 of the first color (blue), rinse and repeat. Decrease the top away, by dividing the total amount of stitches by 6, pm, knit 2tog every marker, knit one round plain, repeat decrease and plain round until you are satisfied. Also towards the end I started decreasing every round. Yarn: Silky Malabrigo in blue and yellow from Imagiknit in San Francisco. I think I bought this in 2009, when I went to my friend’s wedding in September 2009. I love this yarn! It looks beautiful in stockinette and has a slight sheen and is super soft. Above is one of my favorite photos from that wedding that one of the guests took. The light is gorgeous! Needles: Number 3 Knitpicks and I think a number 4 or 5 Addi Natura. This is Ithacowl around my neck. Project begun/ended: I think I started this in the beginning of December and finished at the end. So it took about a month. Notes: I never watched Felicity, the television show, but I believe that she had a hat kind of like this. I saw everyone wearing these slouchy hats, and I wanted one, too. The color scheme was inspired by this random old French movie Diva (which the protagonist in High Fidelity considers one of his top five movies). I don’t remember a lot about this movie except that the titular diva had a very ornate sitting room done up in shades of yellow and blue on the wall, which I admired. Also, that there was a chase scene in a sketchy Paris bowling alley, which I think I’ve actually bowled at. Posted in Finished Objects 2010, Hats, Uncategorized at January 7th, 2011. Yarn: The main color is Frog Tree light fingerling alpaca in light blue, from The Yarn Tree, in Williamsburg, Brooklyn. Left over from my sister’s helmet hat, I had 1.2 skeins left over. It takes about .2 skeins for each mitt, so even if you had half a skein, you would probably be okay. I think at the time I bought it, it sold for $6. It now seems to sell for $6.80. The contrast yarns are all leftovers, from bottom up. I’m not going to link, but if you want to see the original projects, just type the name of the project into search. I’m lazy, deal. Needles: Size 1 and what I thought were 2, but my needle gauge also says are 1s. So maybe 1 and 1.5 DPNs. The photos above show the mitts with the contrast side as the decorative motif and the one below show the side with the pale blue as the decorative motif, with the contrast colors showing as bands of color behind. Project begun/ended: October 16, 2010-November 28, 2010. Each mitt took a week to knit, but I procrastinated in between mitts and blocking and weaving in ends. Notes and modifications: I knit fingerless mitts instead of mittens–I did a row of purl stitches, knit a hem (should have knit a few stitches less to reduce bunching when folding over), folded over, and tacked down. My gauge was fine for fingerless mitts, but too tight for mittens. The main modification I did was to use up sock scraps for the contrast color to create an ombre effect. Also, I reversed the patterns on the front and back (the mirror images) on each mitten so that the patterns would match when I wear them. And for fair isle fans, the insides. Gorgeous, no? I recently saw a J.Crew sweater that had the fair isle inside as the outside. Looks woven and very modern. Especially love the thumbs. You can see how I had some puckering issues on the hem. Posted in Finished Objects 2010, Mittens, Uncategorized at November 29th, 2010. I wanted to make a gray version of my Ithacowl. And I did. I knit this a couple of weeks ago…it only took a week. Pattern: My very own Ithacowl! Free! Yarn: One skein School Products’ Donegal Cashmere Tweed, bulky. $20 for 95 yards. Project began/ended: Started February 5, finished February 13. 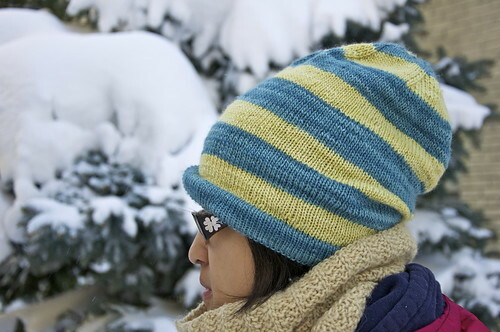 Notes/modifications: I wear my Ithacowl a lot, so I wanted to try making another one. This yarn is much bulkier and has much smaller yardage, so I CO 72 stitches instead, and knit until I ran out of yarn. Once you’re done, the yarn looks kind of ugly and oily. (I think they oil it at School Products for machine knitters?) Wash it in VERY HOT water (the hottest my tap could produce, to the point where I couldn’t touch it), with dish washing detergent. Wash another round in very hot water with vinegar. Soak in a new round with hair conditioner. Rinse. Wack the cowl against the bathtub a bunch. Let dry. Voila! Soft cashmere cowl. Posted in Finished Objects 2010, Scarves, Uncategorized at February 26th, 2010. It was cold, so I was wearing my Hot Pink Mittens. Adam says it looks like I am wearing oven mitts. The pucker at the waist can and will be blocked out–I haven’t washed and blocked it yet. Pattern: Garter Yoke Cardigan, by Melissa LaBarre, in Knit.1 Fall/Winter 2008. [Ravelry link here.] This is (and I am not dissing Melissa/Knitting School Dropout here, because it is a beautiful and clear pattern) a women’s cardigan version of Brooklyn Tweed’s Cobblestone Pullover. Same garter yoke, etc. Yarn: 6.5 balls of Debbie Bliss Tweed. This yarn has extremely minimal yardage, beware. It has 97 yarns of aran weight yarn/ball, which is very little for the price. I can’t remember the exact price for this, though I have a receipt floating around on my desk somewhere. I bought a bag of 10 balls on discount when Yarn Connection went out of business. I’m guessing maybe around $70-80/bag? It seems to retail for $10/ball, and I remember there was about a 20% discount on the yarns, if not more. If I paid $8/ball and I needed 8 balls, then I paid around $64 for the yarn for this sweater. I found my receipt–I paid $77.50 for a bag of 10, and I used 6.5 balls (I originally put 7.5 balls), so 7 x $7.50=$52.50. Plus another $7.50 for the buttons. Knitting, not always so cheap. Anyway, the prototype of this sweater was knit by Melissa in a tweed yarn (the one in the magazine was knit in a solid yarn), which is where I got the idea for my tweed version. Needles: various types of no. 5 needles (circs and DPNs). Project started/finished: Started January 2009, finished January 2010. One year! Notes: When I started knitting this sweater, pretty much right when the magazine came out, and if I had finished it, I would have been the fourth project or so on Ravelry. Now, there are more than 700 projects–almost 800–on Ravelry alone. Basically I started knitting this sweater and then a couple of things happened. First of all, life. I remember when I got laid off, I thought, “Ooooh, I can finish that sweater,” but you know how things go. Anyway, I did actually knit the majority of it in a couple of months, but then the second thing happened. That would be the sleeves. Ugh, I hated how I had tried to taper them (a personal modification not in the pattern), but I SO did not want to rip them out and re-knit them. So I stuffed it in a bag in a drawer and hoped that magical elves would come and reknit them for me. Finally I had to face the music. (Like all of life, I suppose.) I ripped out the sleeves and re-knit them to bracelet length, which meant less work and was also more attractive, I think. Anyway, this pattern is super clear. I found no mistakes. 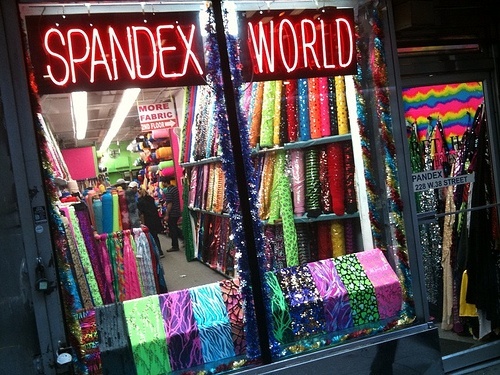 SPANDEX!!! I have never seen so much spandex and glitter. It was like drag queen paradise in there. Anyway, I probably drove the button lady crazy because I first asked for these woven buttons, but then I asked her to pull down other colors and wooden buttons and stuff before changing my mind and going back to my original choice. $0.75/each–I’m not sure if that’s cheap or expensive or what, but at least they were affordable. This is only my second sweater ever (the first one had no sleeves, so it was basically a tube). Came out pretty well, even if it took forever! Posted in Finished Objects 2010, Sweaters, Uncategorized at February 8th, 2010.